Craigllwyn Farmhouse is a large holiday cottage. Well, I say cottage, however, the name probably gives the game away - Craigllwyn Farmhouse is an old farmhouse, and is set in the fantastic countryside in Llansilin, near Oswestry. Sleeping 11 people, Craigllwyn Farmhouse makes a great destination for those looking to spend a little time with friends and family. For something a little special, Craigllwyn Farmhouse also has a private outdoor hot tub. The photo below gives you an idea of the views you can expect while soaking in that hot water. There are large gardens at Craigllwyn Farmhouse too, so you can sit outside and enjoy a cup of tea. Should you decide on a holiday during the colder months, there is a wood burning stove in the living room, which makes for a cosy night in. You don't have to rely on the wood burning stove for all your heating requirements, oil central heating is also available. You have a TV; DVD player; Wi-Fi; washing machine; tumble dryer; dish washer. 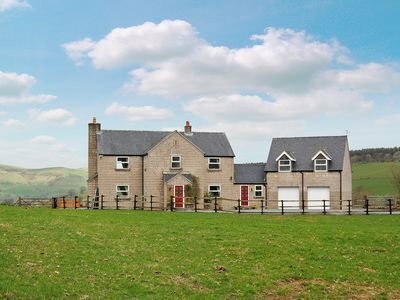 Craigllwyn Farmhouse sleeps 11 people in 5 bedrooms. With the bedrooms being made up of 3 doubles (one with an additional single bed) and 2 twin bedrooms. Should you want to venture out and explore the area, you'll find towns such as Llanfechain, Llangollen, Ellesmere, Welshpool, Wrexham, Corwen and Shrewsbury all within an easy drive. The National Trust properties of Chirk Castle ("Magnificent medieval fortress of the Welsh Marches"), Powis Castle and Garden ("Medieval castle rising dramatically above the celebrated garden") and Erddig ("Atmospheric house, featuring 485-hectare (1,200-acre) country park and formal walled garden") are all within an easy drive. For those looking for some outdoor activities, horse riding, paintballing, quad-biking and go-karting are all available in the area. And with all this open countryside, there's plenty of walking to be had during your holiday at Craigllwyn Farmhouse. Should Craigllwyn Farmhouse not be to your liking, but you fancy staying in the area around Oswestry, you might well be interested in the cottages below. All these cottages are within a few miles of Craigllwyn Farmhouse.